DJI Spark Drone Is Finally Here... The Smallest DJI Drone Ever! DJI Spark is finally here! And it’s set to grab the selfie drones market! After so many leaks, DJI finally released a brand new, tiny selfie-drone DJI Spark. The new drone features all the features that we have seen in previous drones from DJI, but also some new stuff that has never been seen on the drone before. DJI is the smallest drone company ever created. Last year everybody was going crazy about how small and Portable is the Mavic Pro, but in 2017 they got even more extreme with the DJI Spark and made it twice smaller that Mavic. That is a pity DJI Spark doesn’t fold and unfold, but it’s already super small counting only 170mm in diagonal. Another place that we wish DJI could accomplish is to make it weight 250g, but unfortunately Sp, rk weighs 300g more. Even after FAA lawsuit loss, US pilots don’t have to register their drones, users in other countries will have to register their Sparks. 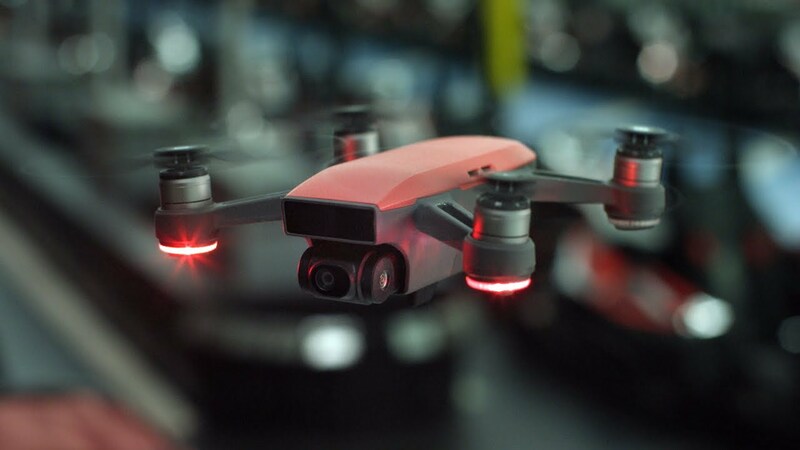 What is truly amazing about DJI Spark is that engineers managed to squeeze the 1.2/3 CMOS sensor into this tiny little drone, not even talking about the gimbal size. None of the mini drones on a market have a 2 axis gimbal of this size. Some of the users might be worried about stabilization as it’s not the 3 axis gimbal, but as DJI said with their new Ultra Smooth technology it’s just as smooth and fluid. DJI Spark comes equipped with a 12MP camera that can shoot Full HD videos (unfortunately no 4K). It’s using a 25mm full-frame equivalent lens and has a fixed aperture of f/2.6. In previous models, you had to be using a remote controller and a phone to control the drone, switch modes and take pictures or videos. With FaceAware, Spark lifts off from your hand by recognizing your face. It takes off and hovers in place within seconds of powering on. With simple gestures, it can also fly around you, take selfies and land back on your palm. You can also control the flight with one single moving it left, right, up, down, back and forward as the drone will fly accordingly. Tap Fly has been split in 2 modes: Coordinate and Direction. Coordinate allows the user to tap the screen and fly to that spot while maintaining altitude. Direction mode lets the drone keep flying in the direction you tap on the screen. Active track mode makes the drone follow you from the front, behind or even circle around you while following. Profile follow lets the Spark drone follow you from a fixed perspective. As you already know the DJI Spark can be controlled in 3 ways: with hands, with a mobile phone and with a proper remote controller (that looks somewhat like a Mavic RC but without the telemetry screen. Although the remote controller looks similar to the Mavic one it’s very different inside as it’s not using the Ocu Sync video transmission system, but connects via Wi-Fi instead. The maximum range you can get out of Spark RC is 2km. However, don’t expect it to fly as far while controlling DJI Spark with a mobile device, as in this case the distance will be limited to 80m and the altitude to 50m. Same as all other DJI products, Spark is using intelligent battery that can keep it in the air for 16 minutes, which is 40-50% longer that other selfie drones on a market. What is really convenient about the DJI Spark is that you can charge it not only with a charger but also with a regular USB cable. DJI Spark features a 3D sensing system, that guarantees the precise positioning indoors and dual band GPS for the best outdoors performance. Front facing obstacle avoidance recognizes the obstacles on the way and stops or flies over it. And of course, the Return To Home feature is still there. It also will be compatible with DJI Goggles, but probably only if you are using a controller. In sport mode DJI Spark maximum speed of 50 km/h. For the basic version, you have to pay $499. The combo with a remote controller will cost you $699. Not too bad considering the how much the other selfie drones cost and how much other selfie drones on a market cost.